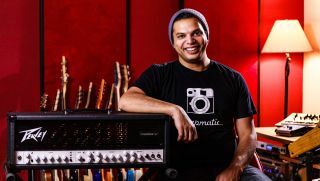 NAMM 2017: Peavey has announced the release of an amp co-designed for heavy players by Periphery virtuoso Misha Mansoor. According to Mansoor, the invective.120 has been in the works for three years; time put to good use in filling out an extensive feature set, including four JJ6L6GC output tubes with top-loaded bias test points and adjustment, paralleled speaker outputs with impedance selector, an MSDI-XLR direct output with Level/Tone/Ground Lift, MIDI out/thru, MIDI footswitch input and much more. Peavey invective.120 press release: Guitarists with heavier tastes looking for their next upgrade will find a sturdy solution in the new Peavey® invective™.120 Head and invective™.212 Cabinet. With design input from Periphery's Misha Mansoor, this dynamic duo is perfectly suited for each other, helping players achieve the most revered metal sounds, from woody and clean to the most extreme of high gain tones. A tube amp only sounds as good as what's inside, and Peavey's invective.120 delivers quality with four matched JJ6L6GC output tubes with top-loaded bias test points and adjustment. On the rear panel, players will find paralleled speaker outputs with impedance selector, an MSDI-XLR direct output with Level/Tone/Ground Lift, MIDI out/thru, and MIDI footswitch input. The included footswitch has nine presets to further help the player achieve their desired tone. Two remote switchable effects loops, half-power switch, and two 9VDC/ 500mA auxiliary power jacks for effects pedals complete the rear panel. On the front panel, players will find even more options and advanced control. The invective.120 Head has a single input with three key remote switchable channels: Clean, Crunch, and Lead. The all new clean channel is voiced to be pristine and uniquely suited to work with closed back cabs. Both the Lead and Crunch channels have independent Pre and Post Gain controls as well as shared low/mid/high EQ, in line with the revered Peavey 6505 head. They also feature a shared switchable front end boost fast attack input noise gate with a threshold for complete control over muting. The standby and power switches with blue jeweled pilot light indicate when the amp is ready. Just adjust the Master Resonance, Presence and Volume knobs, and it's ready to rock. The Peavey invective.212 Cabinet is perfectly suited for use with the invective.120 Head. The solid pine construction provides the most responsive dynamics imaginable and complements the metal-standard Celestion Vintage 30 (8 ohms) speaker paired with the Creamback G12H-75 (8 ohms) speaker. It's a sonic quality so worthy that many guitarists who have already tried the invective.212 describe it as "the best cabinet I've ever heard." Plug right in using the ¼" inputs with Stereo/Mono switch. In Stereo, players will get a left/right configuration rated at 8 ohms per side at over 60 W (RMS) per side. In Mono mode, the invective.212 becomes a 16-ohm cabinet capable of handling 120 W (RMS) of thunderous power. The cabinet's finger-jointed construction and premium components throughout ensure extreme road worthiness and reliability, enabling the player to blast off with confidence.